There are actually a bunch of personal hot pot places in Taiwan. As the name suggests, you sit down at the table with a personal-sized pot full of stock. 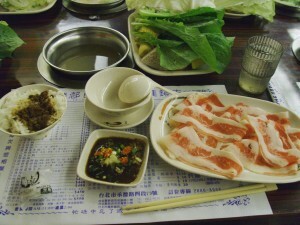 Then, you get a tray full of vegetables and hot pot-stuff like tofu, shrimp, and “tempura”. You then order a meat, like beef, lamb, pork, seafood, and the like. I got beef bacon, which is apparently awesomely fatty slices of beef. You also get to choose as your carbohydrate supplement between different types of rice and noodles. The Makings of a Personal Hot Pot. They also had plenty of stuff to choose from in terms of sauce. 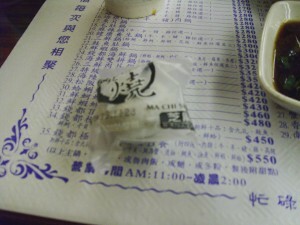 When I say “plenty” I really mean Sa Cha Jiang, soy sauce, vinegar, and add-ins like garlic, hot pepper, and the like. Although they did have egg. I tried mixing raw egg into my sauce for once, it was actually pretty good, thickened up the sauce quite nicely. Something that’s also surprisingly good is putting mochi into the hot pot, as recommended by my mom. Even though the mochi ended up being sweet (it was sesame, I think), having it all nice and warm, soft and chewy was great. Being used to eating mochi straight out of a package, it’s nice to have it in soup-form once in a while. I’d imagine it’s like eating zoni soup or something.